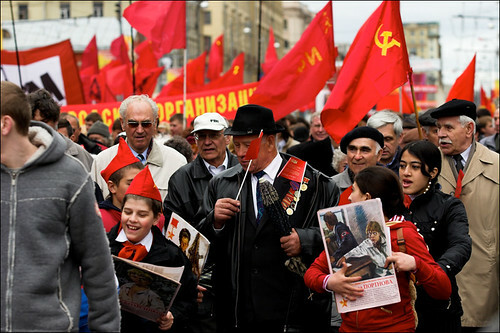 Ukraine’s Constitutional Court ruled as unconstitutional on Friday a law allowing red Soviet Victory flags to be used at annual Victory Day parades in the country. A member of the Our Ukraine – People’s Self Defense nationalist opposition bloc took the issue to court after a dispute between nationalists and World War II veterans during a victory day parade on May 9. The nationalists attacked veterans, tore and burnt Soviet flags, and trod on a wreath that the Russian consul general in Lvov planned to lay at the tombs of Soviet soldiers who died in the war. The court ruled the use of red Soviet flags unconstitutional as they are not included in a list of Ukrainian state symbols. Ukrainian nationalists object to the brandishing of Soviet icons as they claim that Ukraine suffered just as much under Stalin’s Soviet Union as it did under Nazi Germany.